It was great to return to do an Elmore Court winter wedding on such a beautiful winter day! Sophie and Richard lucked out on a gorgeous crisp winter day, frosty and with the sun shining. They had a super chic black tie Christmas theme… and to their surprise Sophies sisters had organised a surprise visit from some reindeer! Actual reindeer which was a wedding day first for me. My top four moments of the day were the reveal of the reindeer! They were incorporated in to a few group shots and were surprisingly well behaved! I feel like I’ve witnessed a lot of wedding day firsts but it was a new one on me and great to take photos of. My second favourite moment of the day happened after the speeches, when the room sang ‘The 12 days of Christmas.’ Each of the 12 tables took a day and with every round it got louder and a little bit more competitive. My third favourite thing from the day was the amazing sunset. Just as we arrived to do wedding photos at Elmore Court the sun was on it’s way down. We got the most stunning light for the group and couple photos, I couldn’t have been happier. And lastly – a rare fourth 4th favourite thing was the bouquet toss. Let’s just say things got a little competitive – and for fear of embarrassment I’ve excluded a few of the photos from this blog post! Often a contentious moment it’s a blinder to photograph. A shout out to AJE Classics for the amazing Jaguar wedding car – it was a beauty! 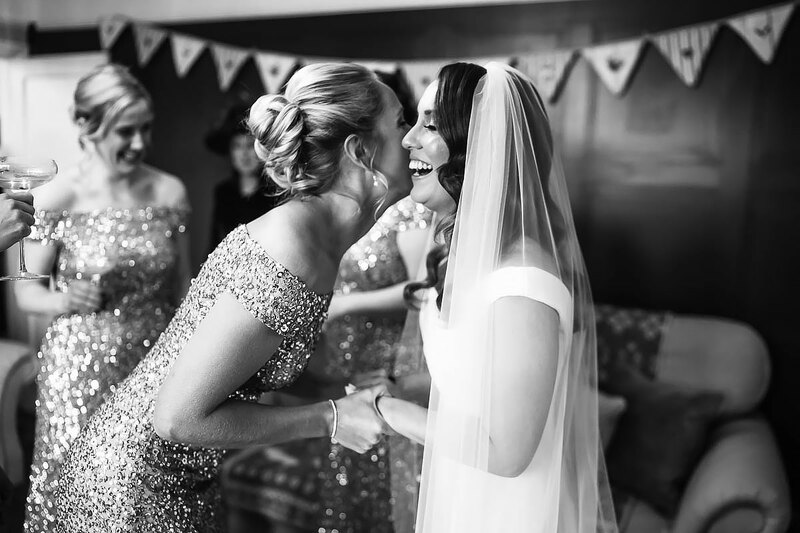 If you’d like to see other Elmore Court wedding photography do check out this link. Huge congratulations to Sophie and Richard – you were so much fun to work with. Thank you so much for having me and making me feel so welcome. Such a vibrant, colourful and happy selection of images dude. Love the feeling you captured especially the dance floor. So, so good! Such variety in the shots and so many great moments captured! Beautiful work as always. Awesome lighting for the first dance. Love elemore and love these pictures dude… classy and fun, Looks awesome. Lovely photos & beautiful venue! Fab photos, beautiful light and atmosphere in the church! Excellent job as always. Great use of light mate. The group shot with a reindeers look awesome! Great set of emotional and fun photos. Lovely use of light and the reindeers were so cool! The reindeer are definitely something I’ve not seen before and love the gusto people are showing singing the 12 days of Christmas! !